Based on a manga by Hotaru Okamoto and Yuko Tone, Only Yesterday was a gentle, soft-focus account of an office lady’s return from the big city to the country hometown she has all but forgotten. Taeko Okajima may not realise it yet, but she is facing a big decision, between town and country or career and domesticity. Is her Yamagata birthplace really a horrid, isolated dump in the sticks, or is it the idyllic, rural home she has always wanted? 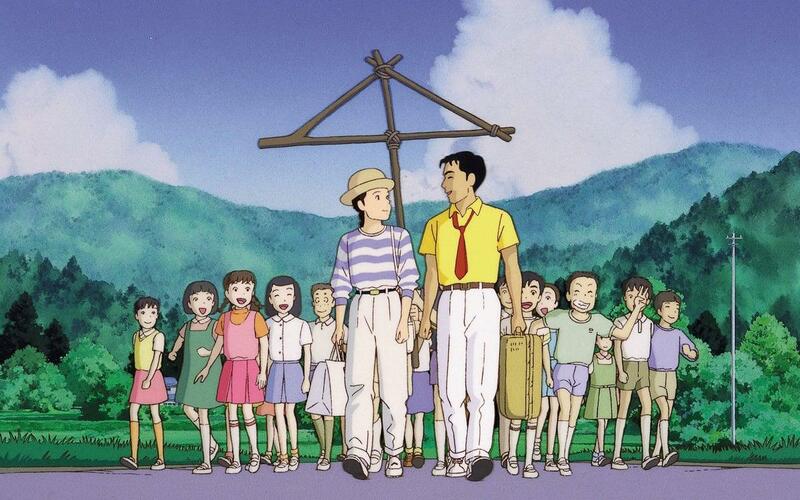 Isao Takahata’s movie adaptation touched a nerve in 1991 Japan. It found its audience among urban yuppies, who were also wondering if their hectic careers were costing them something more soulful. It was a film suffused with nostalgia for the toys and telly of the 1960s, the stumbling steps of growing up, and the self-doubt of a twenty-something singleton. In one iconic moment, cheeky village children wave a wooden post behind the two leads. Two names scrawled beneath a stylised umbrella is the Japanese equivalent of a heart with an arrow through it – the supporting cast turns out to be a little bit ahead of the principals in realising that they are appearing in a romantic movie. It was a delightful, small film, but one that was soon overlooked in an age of increasing demands for box office gigantism. Takahata’s adaptation added much new material; in fact, the entire framing story of the adult Taeko was his own creation – the original manga was solely concerned with her childhood. It’s her adult appearance that can be seen in much of the film’s publicity and stills, unsurprising since that’s what seemed to lure in most of the Japanese audiences, many of them similarly only a generation separated from their rural origins. They came in their droves, earning Only Yesterday 1.87 billion yen at the box office, and trouncing Godfather III in Japanese cinemas. But Only Yesterday is not merely a matter of nostalgia for the 1960s. The sharp-eyed, mathematically-minded anime watcher might notice that while Taeko’s childhood occurs in 1966, her adult return to her village is set in 1982. 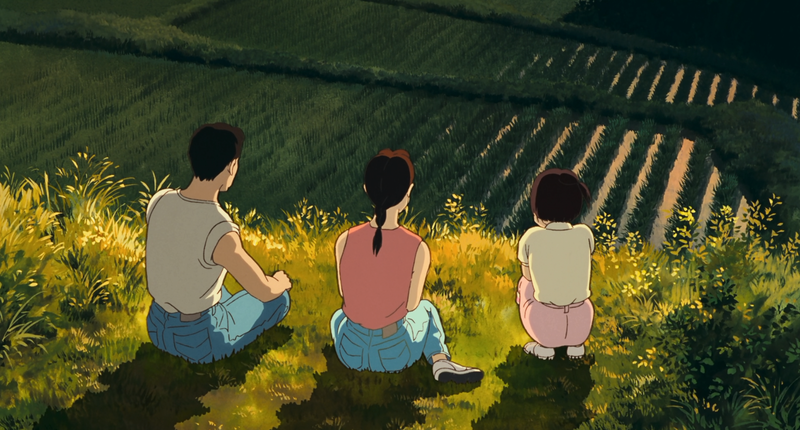 Takahata’s film, made just as Japan’s economy began to slump into its long recession, was hence not only an evocation of the sights and sounds of the 1960s, but also of the early 1980s. He could, like his colleague Miyazaki with My Neighbour Totoro, have simply fudged his dates a little, setting it in a vague general period. Instead, Takahata seems to have deliberately plumped for 1982, allowing for a second wave of nostalgia among teenage Japanese film-goers, allowing them to look back on their childhoods, too. This decision, of course, also neatly ensured that his heroine was on the very cusp of what was then regarded as marriageability, just past the fateful “Christmas-cake” age of 25. Some, most notably Helen McCarthy in the Anime Encyclopedia, have criticised this subtext for fixating on a ticking-clock nuptial time-bomb, but it was very much an element of its time, and seemed to chime with many of the viewers who flocked to it. Released in the UK this year in a Blu-ray dub, the film is now 25 years old – creating yet another nostalgic framing device. The first time Isao Takahata and Hayao Miyazaki went head to head, Miyazaki was the underdog. Miyazaki was the guy who had accepted a challenge to make a children’s movie entirely free of conflict. 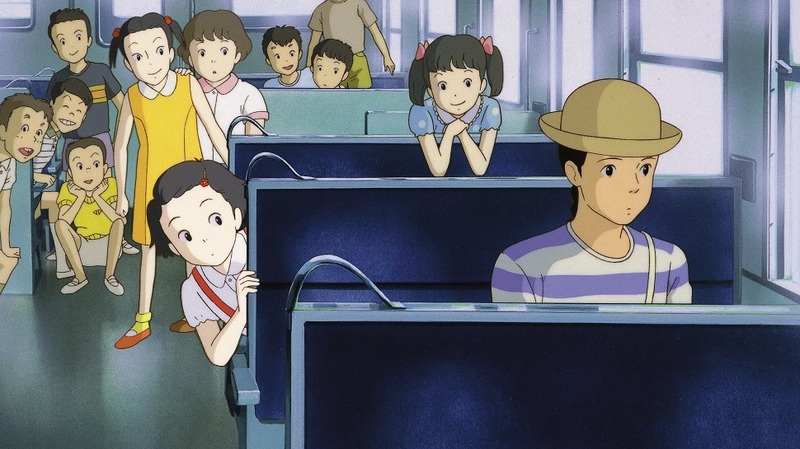 His producer and friend, Toshio Suzuki, was so convinced that the resulting movie would be a flop that he insisted on putting it on a Studio Ghibli double bill with Takahata’s heart-rending war drama, The Grave of the Fireflies. That way, he reasoned, Takahata’s movie would pack in the compulsory block-bookings from school outings, and the kids could take or leave Miyazaki’s mad My Neighbour Totoro. The rest, as they say, is history. Totoro became one of the best-loved movies in animation history, so in demand all around Japan that there weren’t enough prints of Grave of the Fireflies to accompany it. Grave remains a classic of Japanese cinema, but it’s not what you would ever call a “feel-good movie.” Takahata followed up with the touching eco-comedy Pom Poko, about racoons with magic testicles, and that, too, was number one at the Japanese box office. But being number one was no longer enough! Set the box office figures for Ghibli films on a graph, and Miyazaki and Takahata were practically neck and neck until 1997. Only Yesterday’s takings stopped just short of two billion yen; Miyazaki’s Porco Rosso just over it. But in 1997, Miyazaki’s Princess Mononoke rocketed ahead, kicking off his run as a world-beating box-office winner. Takahata’s 1999 movie My Neighbours the Yamadas did reasonable numbers by the standards of the previous decade, but were considered a flop in the era of Ghibli blockbusters. It is deeply, deeply unfair to consider Takahata as an also-ran of the anime business. The senior of the pair, he was instrumental in Miyazaki’s training and career, and a vital contributor to the success of all of “Miyazaki’s” movies. Each would work as a foil to the other on their various projects, right up to their final films. In any film industry that had not seen the exponential takings of Miyazaki’s later movies, Takahata would have been a national treasure. But Miyazaki’s early 21st century success has swamped his colleague’s profile abroad. I still run into movie buffs who do not even know Studio Ghibli has more than one director. Meanwhile, mainstream publications that only cover one anime a year plump for the one their readers will have heard of, rather than his long-term collaborator. In 2013, things came full circle. Toshio Suzuki hatched a plot to release Takahata’s last film on the same bill as Miyazaki’s, thereby allowing the under-earning mentor to piggy-back on the sure-fire box office of his student. But Takahata didn’t finish his heavily stylised Princess Kaguya in time, and it was left to fend for itself, earning relatively meagre ticket sales. Now approaching his 71st birthday, Takahata is unlikely to complete another feature film as director, although he hopefully has many years ahead of him to write some quirky, romantic memoirs of his own. Jonathan Clements is the author of Anime: A History. This article originally appeared as two separate pieces in Geeky Monkey #13 and NEO #155, 2016.